Home / About the IB / What is the IB? IB stands for International Baccalaureate; it was founded in 1968 as a non-profit educational foundation offering four highly respected programmes of international education. These programmes develop the intellectual, personal, emotional, and social skills needed to live, learn and work in a rapidly globalizing world. Schools must be authorized by the IB organization in order to offer any of the programmes. 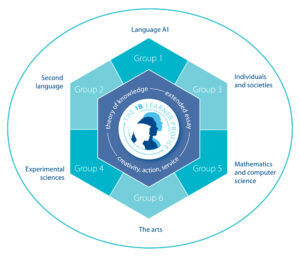 The IB works with schools, governments and international organizations to develop challenging programmes of international education and rigorous assessment. The IB has earned reputation for high standards of teaching, pedagogical leadership and student achievement. The IB Mission is to create a better world through education; the IB achieves goals by working with partners and by actively involving stakeholders, particularly teachers. These programmes encourage students across the world to become active, compassionate and lifelong learners who understand that other people, with differences, can also be right. The IB is registered in Switzerland as a non-profit organization. It is governed by an elected 17-member Board of Governors, which appoints the Director General, sets the strategic direction of the organization, adopts a mission statement, makes policy, oversees the IB´s financial management, and ensures the autonomy and integrity of IB Diploma Programme examinations and other student assessments. Board membership represents cultural and geographical diversity. • other fees, including donations. For donations to the IB please click here.